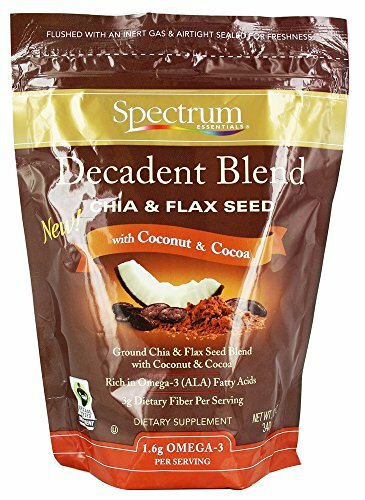 Spectrum Essentials Decadent Blend Chia & Flax Seed, with coconut and cocoa, brings together the health benefits of Omega 3 and fiber with the flavors you love. An irresistible combination of coconut with the rich chocolate taste of Fair Trade Certified cocoa, Spectrum Essentials Decadent Blend Chia & Flax Seed is sweet bliss. Try Spectrum Essentials Decadent Blend Chia & Flax Seed sprinkled on hot cereals and yogurt, or in smoothies, puddings, pancakes, waffles and baked goods.